Gastrostomy is a surgical procedure for inserting a tube through the abdomen wall and into the stomach. The tube, called a "g-tube," is used for feeding or drainage. Gastrostomy is performed because a patient temporarily or permanently needs to be fed directly through a tube in the stomach. Reasons for feeding by gastrostomy include birth defects of the mouth, esophagus, or stomach, and neuromuscular conditions that cause people to eat very slowly due to the shape of their mouths or a weakness affecting their chewing and swallowing muscles. Gastrostomy is also performed to provide drainage for the stomach when it is necessary to bypass a longstanding obstruction of the stomach outlet into the small intestine. Obstructions may be caused by peptic ulcer scarring or a tumor. In the United States, gastrostomies are more frequently performed on older persons. The procedure occurs most often in African-American populations. Gastrostomy, also called gastrostomy tube (g-tube) insertion, is surgery performed to give an external opening into the stomach. Surgery is performed either when the patient is under general anesthesia—the patient feels as if he or she is in a deep sleep and has no awareness of what is happening—or under local anesthesia. With local anesthesia, the patient is awake, but the part of the body cut during the operation is numbed. the gullet (esophagus) into the stomach. The light shines through the skin, showing the surgeon where to perform the incision. The other procedure does not use an endoscope. Instead, a small incision is made on the left side of the abdomen; an incision is then made through the stomach. A small flexible hollow tube, usually made of polyvinylchloride or rubber, is inserted into the stomach. The stomach is stitched closely around the tube, and the incision is closed. The length of time the patient needs to remain in the hospital depends on the age of the patient and the patient's general health. In some cases, the hospital stay can be as short as one day, but often is longer. Normally, the stomach and abdomen heal in five to seven days. The cost of the surgery varies, depending on the age and health of the patient. Younger patients are usually sicker and require more intensive, and thus more expensive, care. Prior to the operation, the doctor will perform an endoscopy and take x rays of the gastrointestinal tract. Blood and urine tests will also be performed, and the patient may meet with the anesthesiologist to evaluate any special conditions that might affect the administration of anesthesia. Immediately after the operation, the patient is fed intravenously for at least 24 hours. Once bowel sounds are heard, indicating that the gastrointestinal system is working, the patient can begin clear liquid feedings through the tube. The size of the feedings is gradually increased. Patient education concerning use and care of the gastrostomy tube is very important. Patients and their families are taught how to recognize and prevent infection around the tube; how to insert food through the tube; how to handle tube blockage; what to do if the tube pulls out; and what normal activities can be resumed. There are few risks associated with this surgery. The main complications are infection, bleeding, dislodgment of the tube, stomach bloating, nausea, and diarrhea. Gastrostomy is a relatively simple procedure. As with any surgery, however, patients are more likely to experience complications if they are smokers, obese, use alcohol heavily, or use illicit drugs. In addition, some prescription medications may increase risks associated with anesthesia. The patient is able to eat through the gastrostomy tube, or the stomach can be drained through the tube. A study performed in 1998 on hospitalized Medicare beneficiaries aged 65 years or older who underwent gastrostomy revealed substantial mortality rates. The in-hospital mortality rate was 15.3%. Cerebrovascular disease, neoplasms, fluid and electrolyte disorders, and aspiration pneumonia were the most common primary diagnoses. The overall mortality rate at 30 days was 23.9%, reaching 63% at one year and 81.3% at three years. There are no alternatives to a gastrostomy because the decision to perform it is made when a person is unable to take in enough calories to meet the demands of his or her body. Griffith, H. Winter. Complete Guide to Symptoms, Illness, & Surgery, 3rd edition. New York: The Body Press/Perigee, 1995. Ponsky, J. L. Techniques of Percutaneous Gastrostomy. New York: Igaku-Shoin Medical Pub., 1988. Angus, F., and R. Burakoff. 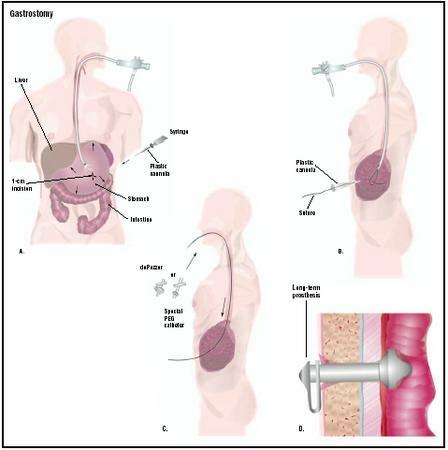 "The Percutaneous Endoscopic Gastrostomy Tube. Medical and Ethical Issues in Placement." American Journal of Gastroenterology 98 (February 2003): 272–277. Ciotti, G., R. Holzer, M. Pozzi, and M. Dalzell. "Nutritional Support Via Percutaneous Endoscopic Gastrostomy in Children with Cardiac Disease Experiencing Difficulties with Feeding." Cardiology of the Young 12 (December 2002): 537–541. Craig, G. M., G. Scambler, and L. Spitz. "Why Parents of Children with Neurodevelopmental Disabilities Requiring Gastrostomy Feeding Need More Support." Developments in Medical Child Neurology 45 (March 2003): 183–188. Niv, Y., and G. Abuksis. "Indications for Percutaneous Endoscopic Gastrostomy Insertion: Ethical Aspects." Digestive Diseases 20 (2002): 253–256. "Stomach Tube Insertion." HealthAnswers. [cited July 6, 2003]. http://www.healthanswers.com . The procedure is performed at a hospital or surgical clinic by a surgeon or gastroenterologist trained in endoscopy and placement of these tubes. How is the g-tube insertion done? Will I be able to eat normal food? Will people notice that I have a g-tube? This article is very informative. It provided information in such a way that a layman can understand the procedure. If the pump is put on hold during patient care can the head of the bed be lowered? I got a gtube put in just a week ago. I've been haveing problems getting nutrion because i don't eat. I have a condition called Neurofibromatosis 2 (NF2). And i have had problems swallowing my whole life. Well they just found my esphogase goes into muscle spasams when i eat. But i've been haven fluid leaking through the tube underneath the dounght. The surgon couldn't find my stomache. and so a radialogist had to do it with a ct scan. But im supposed to get it fixed by them tightening the tube. So we'll see. It's not been easy. They sent me home less then an hour after the surgery. And the surgery hurt like u couldn't imagine and they had me on triple of medication ( then the nomale person would get) . So i hope this helps . Would drinking alcohol (beer) have any effect on the g-tube if the patient is still able to eat and drink by mouth while the g-tube is in place? The information is wonderful. I enjoyed reading it, more of my doubts are cleared.well planed artical.good job. Show this to your doctor. This explains most of your complications that have landed you in the hospital in so much pain and at times appearing to be near death. It's been 3 years since my g tube was pulled out after my double lung transplant and I now have quite a bit of redness at the site and feel some pain when I eat. Could this be a fistula? CAN ONE GET ADEQUATE NUTRITION THROUGH GASTROSTOMY. My daughter has a feeding tube to her stomach. I would like to know if the opening between the surface of her skin, and the stomach has a tubular scar connecting the stomach through to the outer opening. Like a straw, or, should the tube's balloon break, if the contents of her stomach can spill into her abdominal cavity. My moms feeding tube is draining black thick sub. What can this be and is there something to stop this? My mother had pancreatic cancer therefore she opted to have the Whipple procedure done. The doctors said that it would be best for her to get a feeding tube because she was not getting the nutrition she needed to gain her health back. There were quite a few complications she had after getting the tube. She had to have the tube replaced at least three times because the tube kept slipping out. Well just recently we had another issue with her tube coming out and of course I had to take her back to the hospital to have the tube replaced. Mind you all my mother was feeling fine up until after her third tube replacement. She was discharged from the emergency department to go home. She was fine the first night but the two nights later following her discharge she was in agonizing pain. I was informed that the pain she was having was normal being that she went through this procedure twice before. My mother passed away two days later. And to this day I believe this lasts visit for a replacement bought about the demise of mother because of improper placement of the tube. I forgot to mention they sent her home with nothing for the pain. Please everyone if your loved one is showing any kind of effect that raises your concern please no matter how many visit or phone calls you have to make to doctors or hospitals do it. Better to be safe than sorry. Research all you can to educate yourself about these feeding tubes. After surgery of the peg placement .. What test are done to see if the insertion was in the proper place? Are scans done? X-rays? Which of these would show if other organs were effected during placement of the peg? I have had a G-J tube for 3 weeks now due to sluggish digestion. I have not had a normal meal since early Feb. I was hospitalized for 2 weeks before they decided to put in a feeding tube and stayed a week afterwords. They want me pumping for 12 hours at 100 mL per hour, however, I am only able to pump 38 mL per hour and even that keeps me bloated. I am still having some pain, burning, and itching around the tube site - especially when trying to move around. I am not running any fever. Is this normal? in trying to insert a g tube i meet resistance should i retry or call the doctor. my son has to have a stitch put in his stomach because the hole where his gtube was isnt closing up so my question is will he have to go under anesthesia? also will it be an overnight stay? My brother got his tube taken out of his stomach three days ago now his food is coming out of his stomach and I have to change his shirts a lot from him getting soaped. They told the hole could close up soon after taken it out. I have been cleaning it and now its hard and red. What is going on its not normal. I had a feeding rude put in as an infant, & don't like the scar it left. how can I get rid of that ? My mom had Whipple sugery. Her lung collapsed due to being punchard. When central line was inserted.she developed ARDS.her stomach after 2 months is still not tolerating feeding tube. She does for a few days.then it has to b turned off.we have pleaded with her Dr to place it directly in her gut.would this be possible and help her to get some nutrition. where can i get statistics on how many Gastrostomy surgeries are performed each year. My sons g tube fell out in January 2015. We left it alone to let it close because he did not really need it anymore as he was doing better with all his medical problems. It use to drain but not a lot. A few months prior to today I noticed it doesn't drain at all even though from what we can see it isn't fully close because it still looks like a small open scab. Now its been about 7 months and last night I seen it draining clear fluid. All his different doctors have seen it and never said anything bad about it but now that its drained out like it did after not draining at all for so long, I'm worried now. I've always cleaned the site and scar and then I put a little triple antibiotic over the scab and cover it up. What else can I do? or Am I doing the wrong thing? My grandmother's stomach bag slipped out through the incision . We are wondering how that happened. The caregiver who was there says she doesn't know. My grandmother is not strong enough to pull it out. Any thoughts? My wife has the feeding tube. The question I have is, the feeding tube is not clogged, but she woke up one morning and part of the feed tube is a light brownish color. What could cause that?